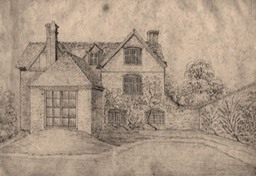 Pencil sketches of Vicarage House done in 1824 by Penelope Justice and given to her friend, Caroline Russell, daughter of the then Vicar, Revd John Russell. Caroline Russell kept the drawings in a journal/common-place book, found recently by Wendy Ford in an antiques fair. 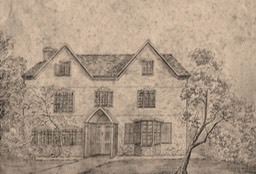 Vicarage House still exists, but looks rather different today. Revd Russell died in 1828 and is buried in the churchyard. Thanks to Wendy Ford who sent the drawings.